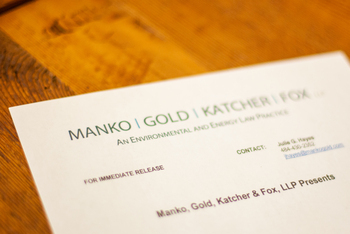 Philadelphia, PA (November 19, 2013) – Manko, Gold, Katcher & Fox attorneys Jonathan Spergel and Michael Gross will join Richard Heany of O’Neill Properties and Greg Rogerson of J.G. Petrucci Company to present, “The Real Estate Hibernation Has Ended—What Developers Need to Know About Key Environmental Regulatory Changes in the Post-Recession Economy.” The panel session, including both veteran developers and experienced environmental law practitioners, will take place on Wednesday, December 11, from 10:45 to 11:35 a.m., at the Radisson Hotel Valley Forge, King of Prussia, PA, as part of the 2013 PA Brownfields Conference running December 9-11, 2013. For more details and to register visit http://www.eswp.com/brownfields/.